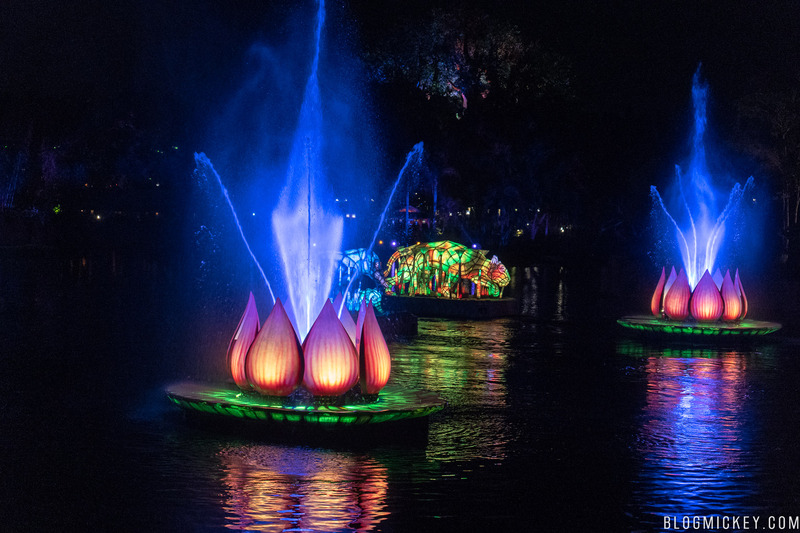 Last night was the debut of the Rivers of Light Dessert Party at Disney’s Animal Kingdom and we were in attendance to review it. 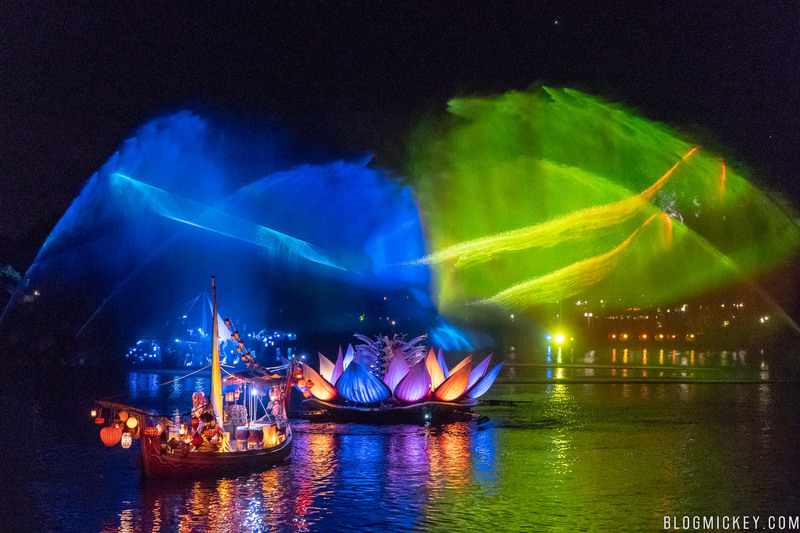 Taking place from 8pm through the end of the show, the Rivers of Light Dessert Party has a total experience time of about 90 minutes. The cost of the event is $79 per adult and $47 per child, including tax. No gratuity is included or required. So how was it? Let’s take a look. 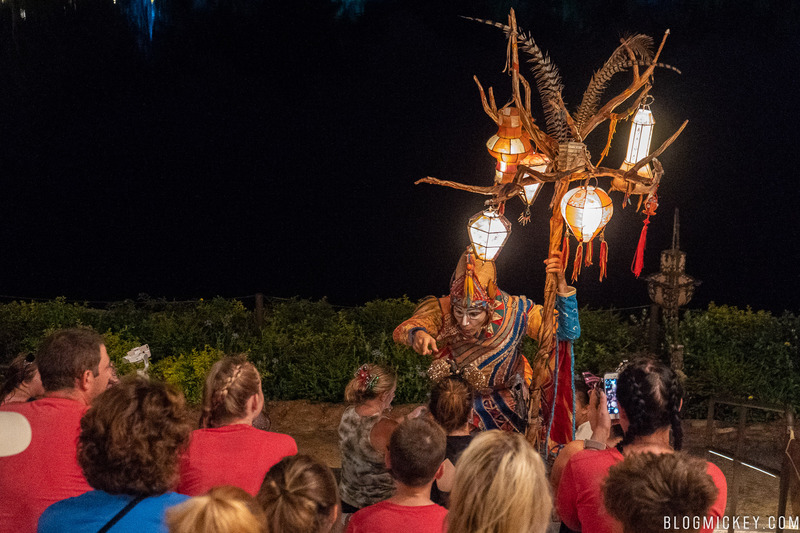 Guests on the first night had a bit of a tough time finding the check-in location, but Cast Members staffing the standby and FastPass entrances were very helpful. There isn’t any signage directing you to the back of the seating area on the Asia side, but that’s where you want to go. 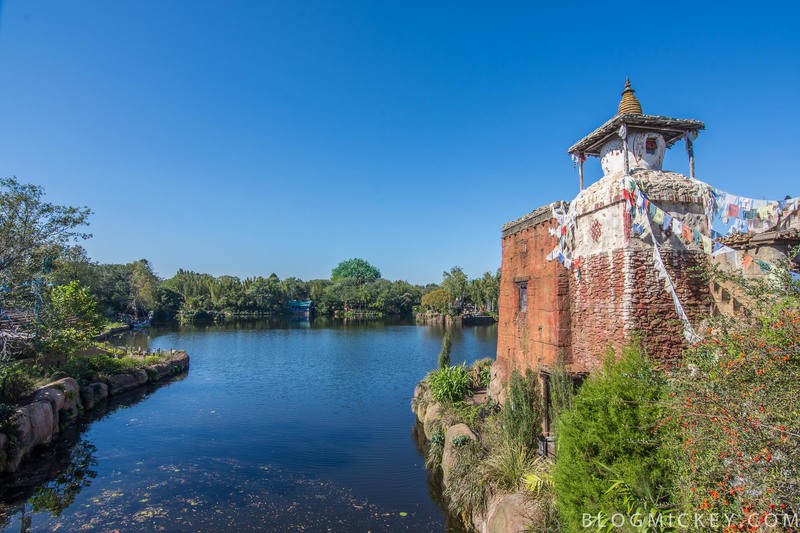 If you’re coming from Asia, you’ll walk past the FastPass line, past the Expedition Everest entrance, and back to a somewhat hidden entrance. 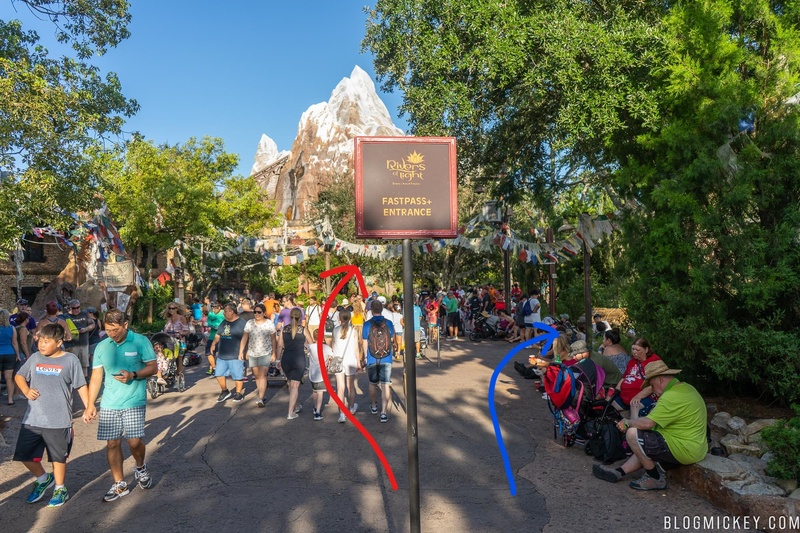 As seen below, you’ll want to take the red route past the FastPass entrance in blue. If you cross the bridge from Asia, you’ve gone too far. 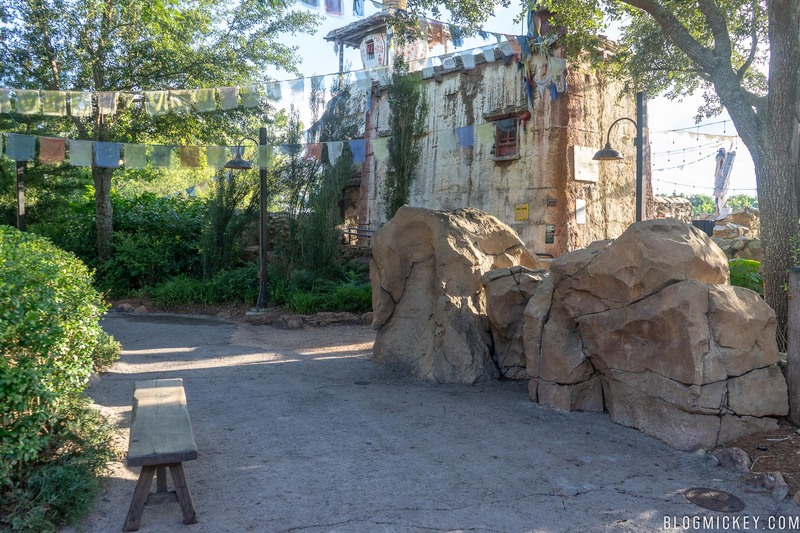 From the DinoLand side, you’re going to walk past Finding Nemo – The Musical, over the bridge, and you’ll find the entrance to the left. Ultimately, you’re looking for the large show control building and the small Cast Member entrance to the rear of it. Cast Members started to show up about 15 minutes prior to the event start time, and started to check us in promptly at 8pm. 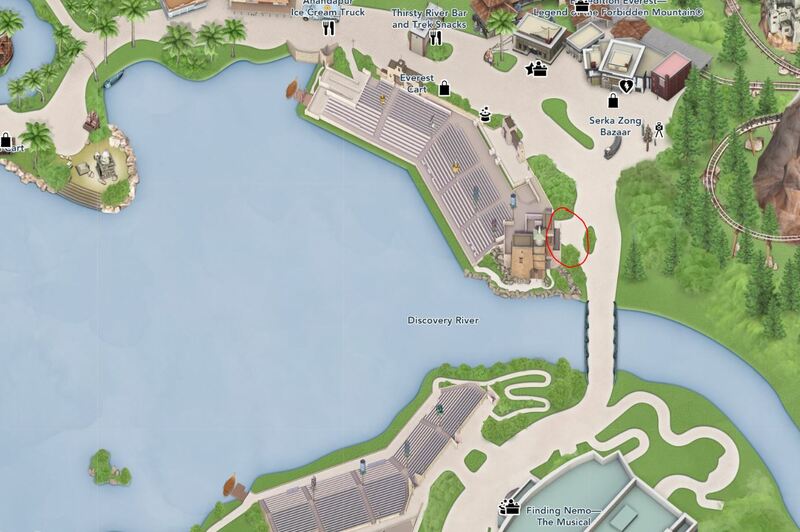 The area that the dessert party takes place in is the open space around the show control building and center-most seating area as it relates to the show. 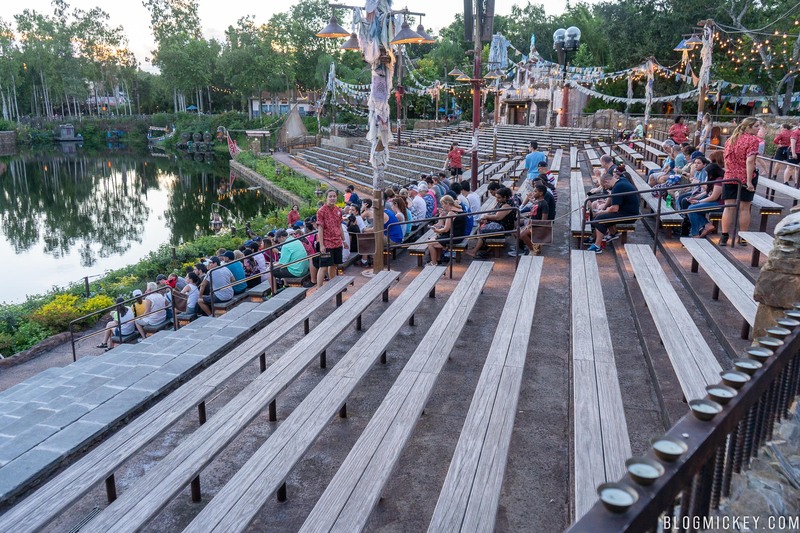 Really, this is probably the best seating you can find in the Rivers of Light amphitheater, with the second best seating found on the DinoLand side and utilized by the Rivers of Light Dining Package. 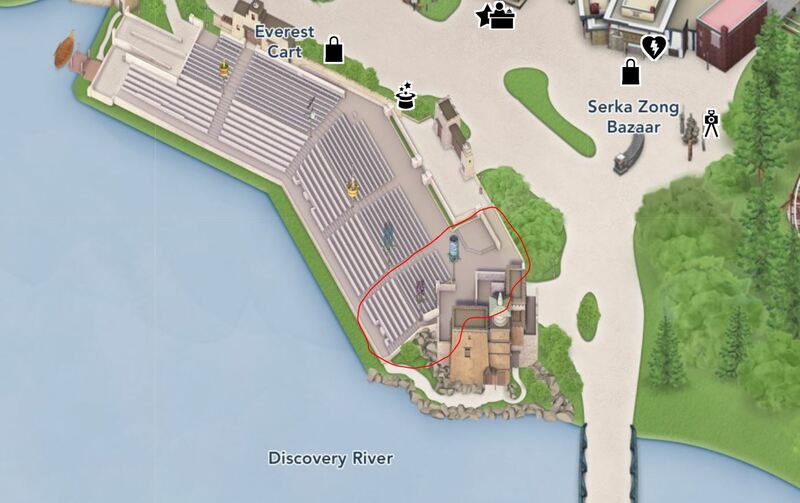 I’ve circled the Rivers of Light Dessert Party space below. The space consists of standing tables spread around three clustered areas. 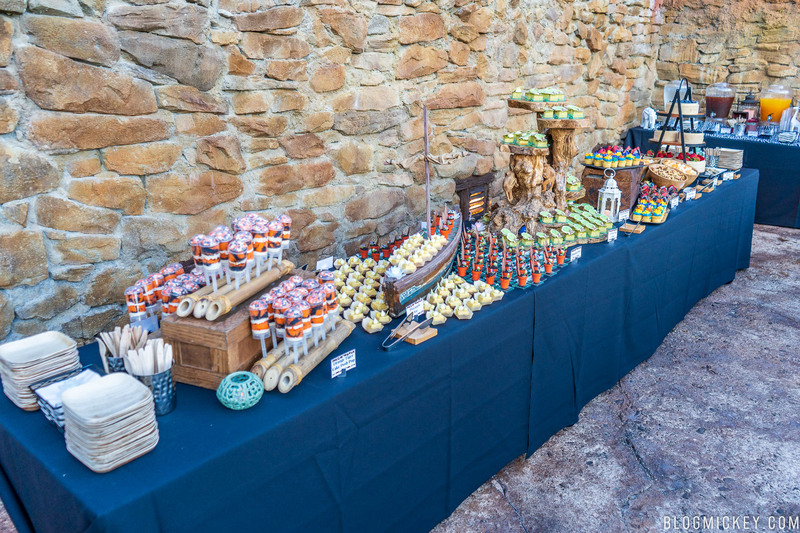 One is next to the desserts, and was the area we choose to grab a table in, one is a few steps away on an elevated platform, and one is up a few steps up to a nice overlook area. There really isn’t a bad table as you’ll likely move down to the exclusive seating area come showtime anyway. Now it’s time to take a look at the desserts. 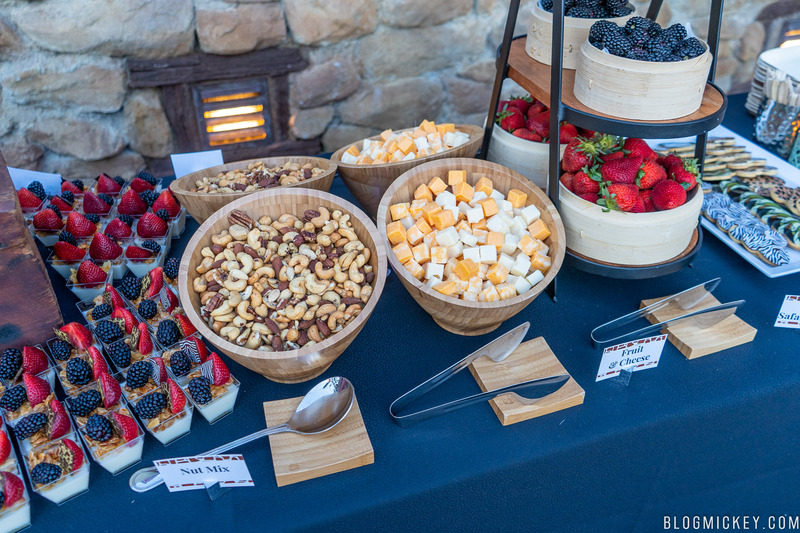 There are seven desserts total as well as a nut mix, cheese selection, and fresh fruit. 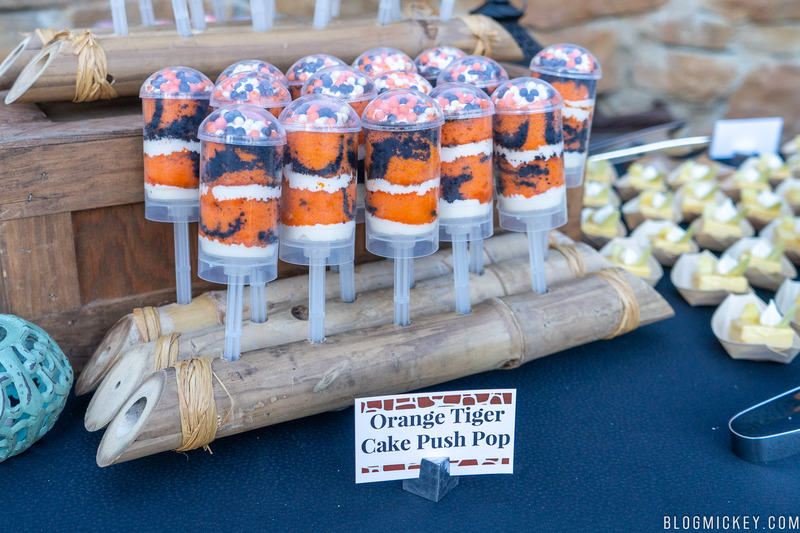 First up is the Orange Tiger Cake Push Pop. It’s a fun dessert with a few layers of cake and cream. 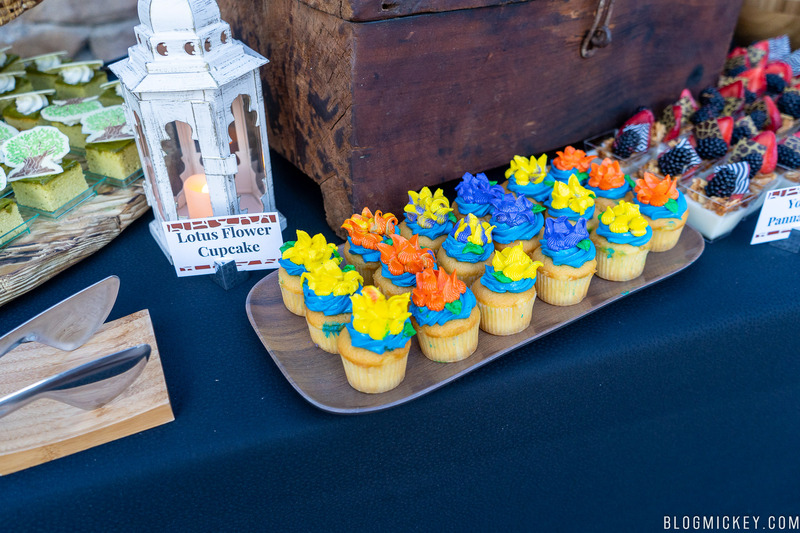 It’s topped off with some Crisp Pearls like you might find on a host of Walt Disney World desserts, including the Grey Stuff at Be Our Guest Restaurant. The orange color is more decorative than flavorful, as we found the cake to be a moist sponge without any orange flavoring. This was probably the highlight of the evening, as far as the desserts go. 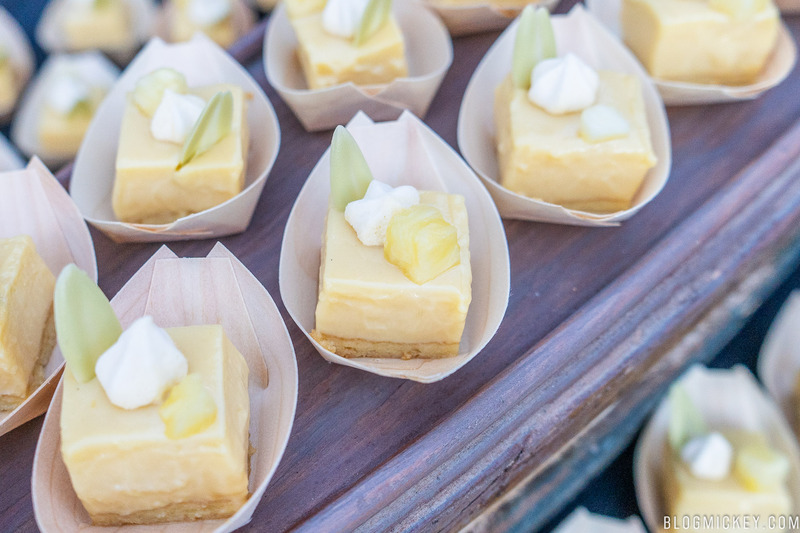 You’ll find a single, fresh pineapple cube atop a multi-layer bar that faithfully carries the pineapple taste through to the end. 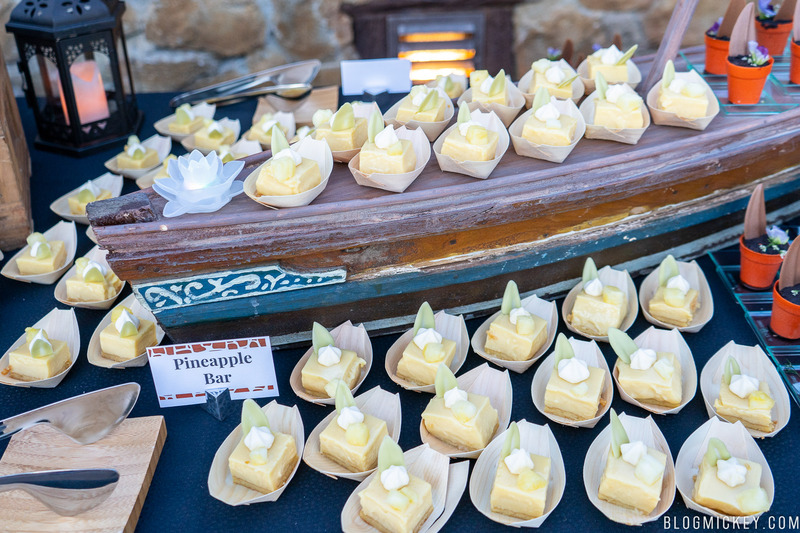 The light and airy mouse sits atop a vanilla biscuit, while a white chocolate leaf and small meringue adorn the dessert. Up next is the Chocolate Pot de Creme. Chocolate lovers will really enjoy this dessert that employs chocolate through and through. 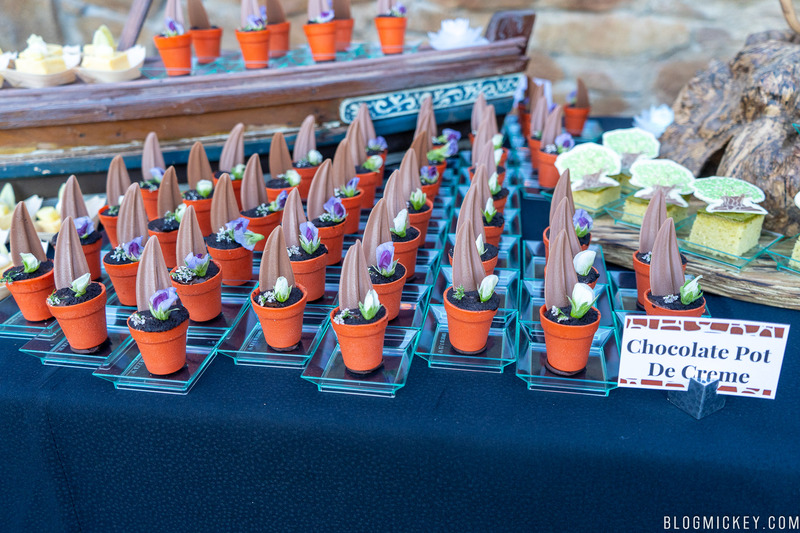 Let’s start with what is probably the best part of the dessert though – the pot is edible! A white chocolate pot holds a chocolate pudding inside with a dusting of chocolate “topsoil” on top. 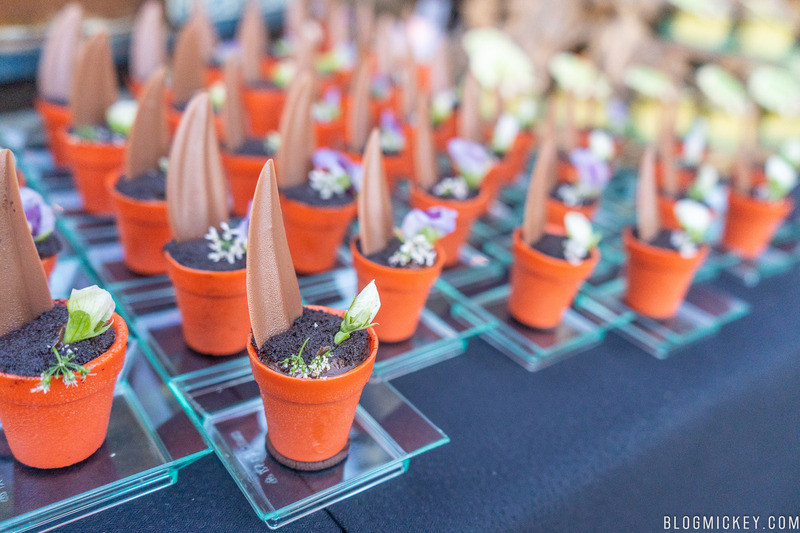 From top to bottom, the entire dessert is edible – including the flowers. This was the most ambitious dessert of the evening, with a noticeable green tea flavor in every bite. 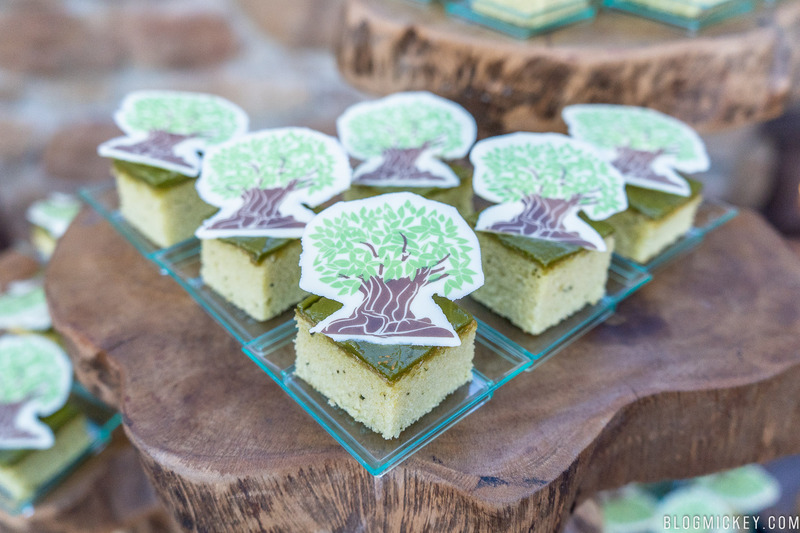 Perched atop a wonderful display that mimics the actual Tree of Life, you’ll find a moist green tea cake with a printed version of the Tree of Life on it. If you like green tea, you’ll like this dessert. 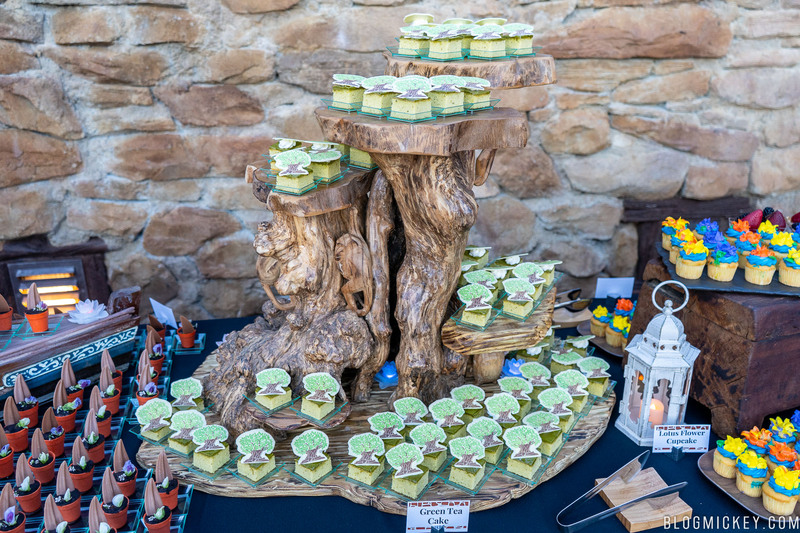 If you don’t like green tea, it’s still worth a try as the most unique dessert of the party. 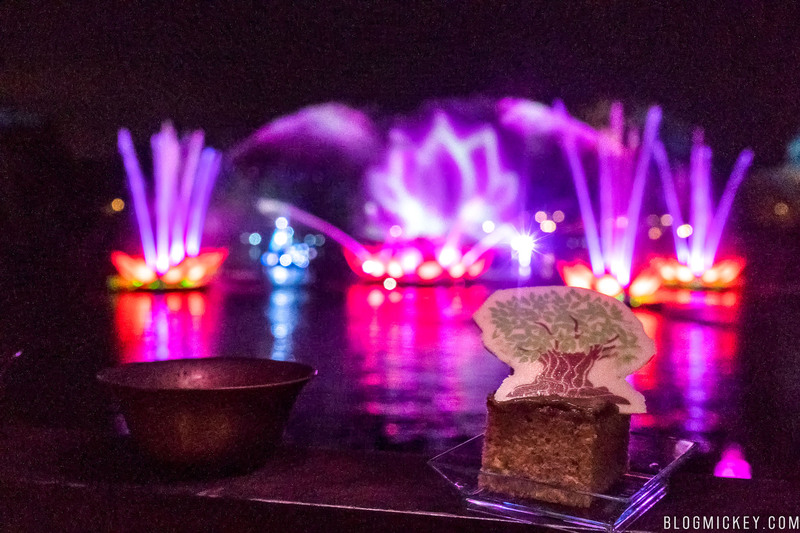 A mini cupcake awaits you as you watch the larger versions of the lotus flowers floating on the Discovery River prior to showtime. 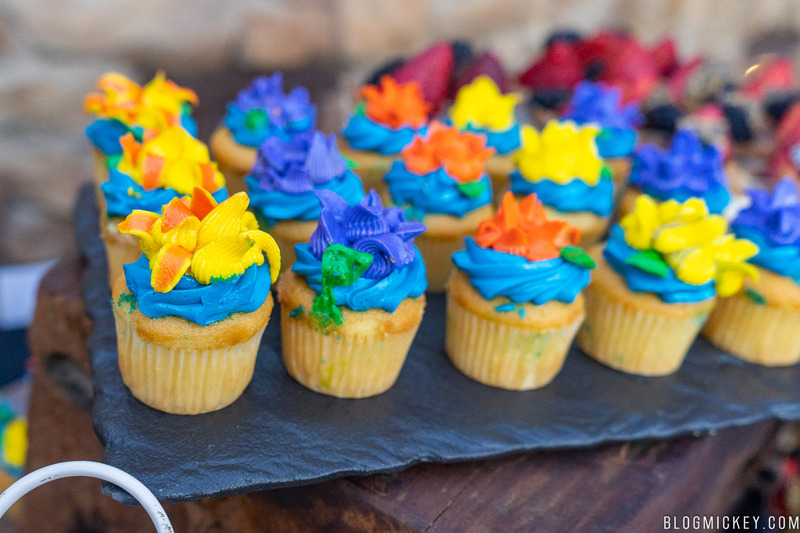 A yellow cake is used as the base and a standard frosting can be found on top of this beautifully decorated cupcake. Blackberries, strawberries, almonds, and a decorative chocolate design are placed on top of a cup of Dannon yogurt. 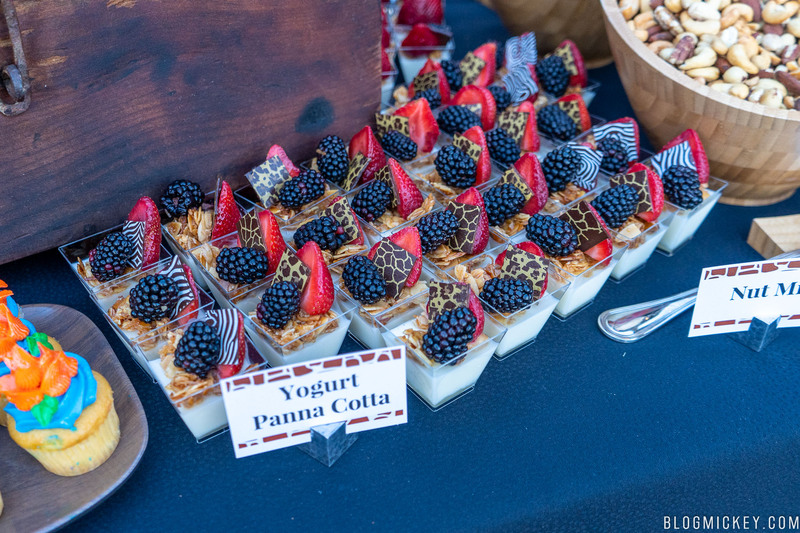 The yogurt and panna cotta dish provides a great start to savory options for those looking an alternative to the sugary desserts. 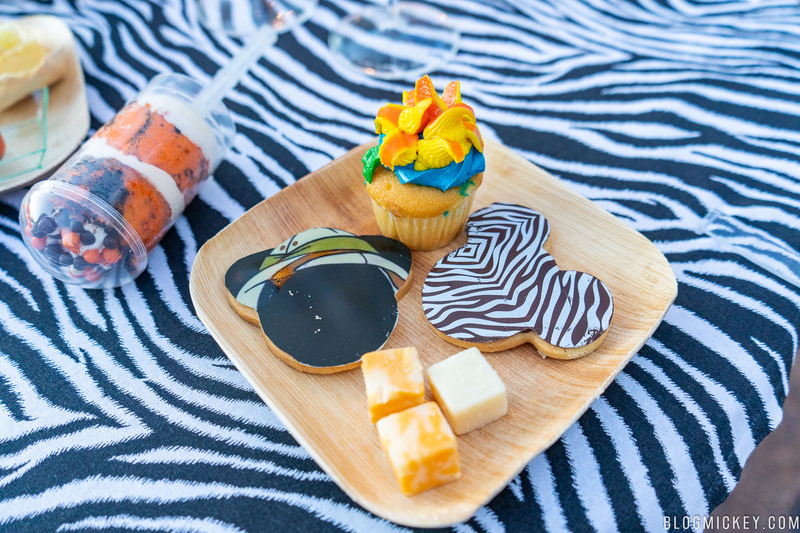 A variety of Animal Kingdom themed Mickey-shaped cookies were also available. We found that the cookie was rather standard sugar cookies, but the designs made for some fun photos! At the end of the table you’ll find a bowl of mixed nuts that include cashews, almonds, pecans, hazelnuts, brazil nuts, and walnuts. Next to the nuts, you’ll find cubes of three cheeses: havarti, muenster, and gouda. Finally, you’ll find blueberries, blackberries, and strawberries, all noticeably fresh. 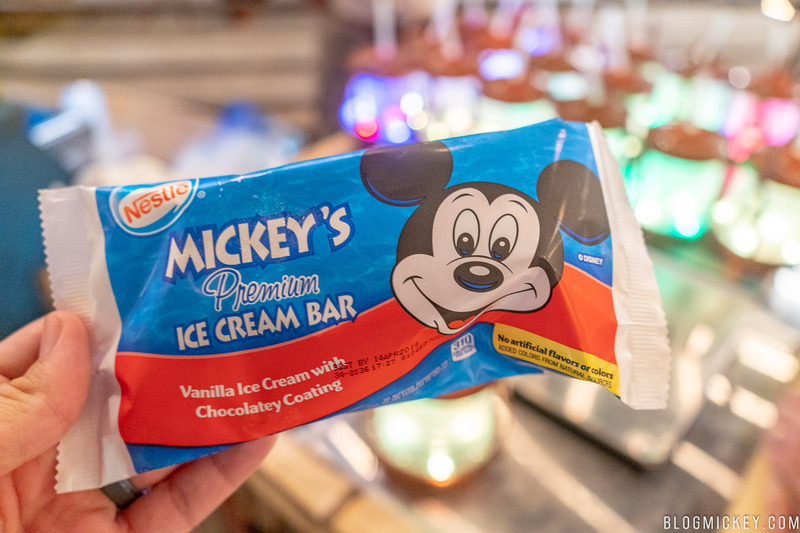 In addition to all of the desserts listed above, guests can also get as many Mickey’s Premium Ice Cream Bars as they’d like – included with the party. 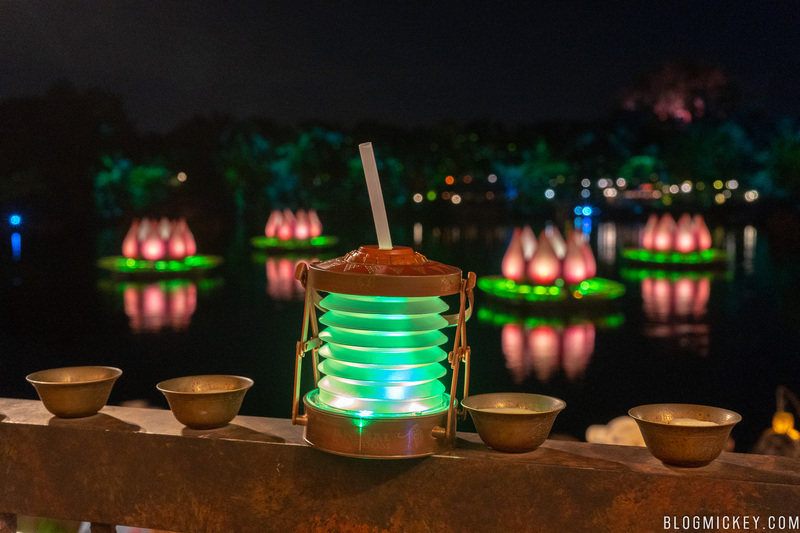 The Rivers of Light Dessert Party also includes as many alcoholic drinks as you’d like. There are two premixed drinks, two wines, and two beers for your consideration. 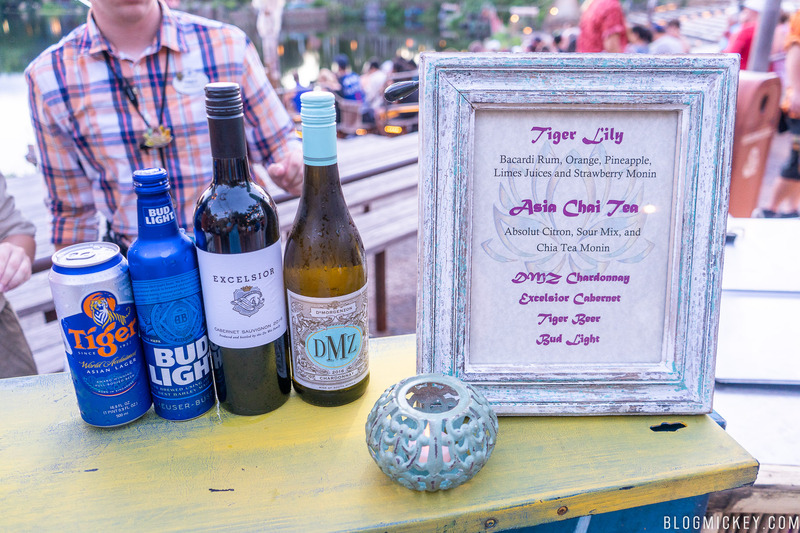 Our favorite mixed drink of the evening was the Tiger Lily. Bacardi Rum, Orange, Pineapple, Lime Juices and Strawberry Monin combined for a really refreshing drink. 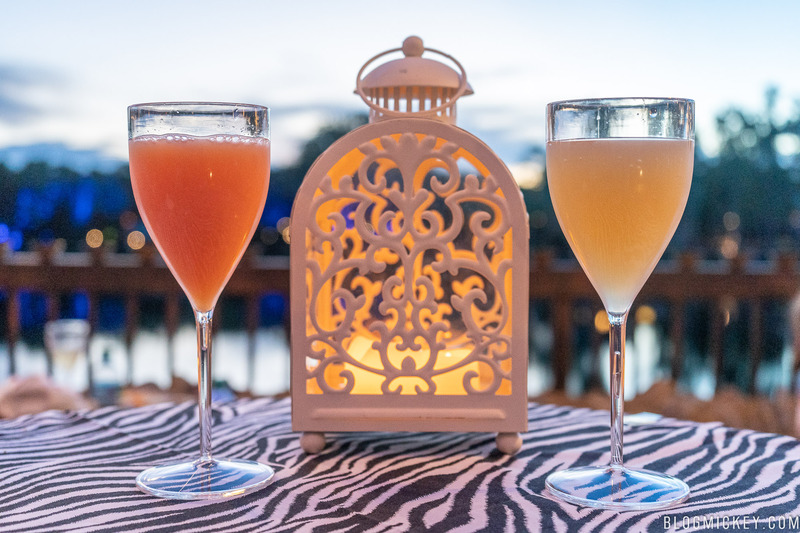 The drink was fruity and citrusy; perfect for the warm summer evenings in Orlando. In the Asia Chai Tea you’ll find Absolut Citron, Sour Mix, and Chai Tea Monin. 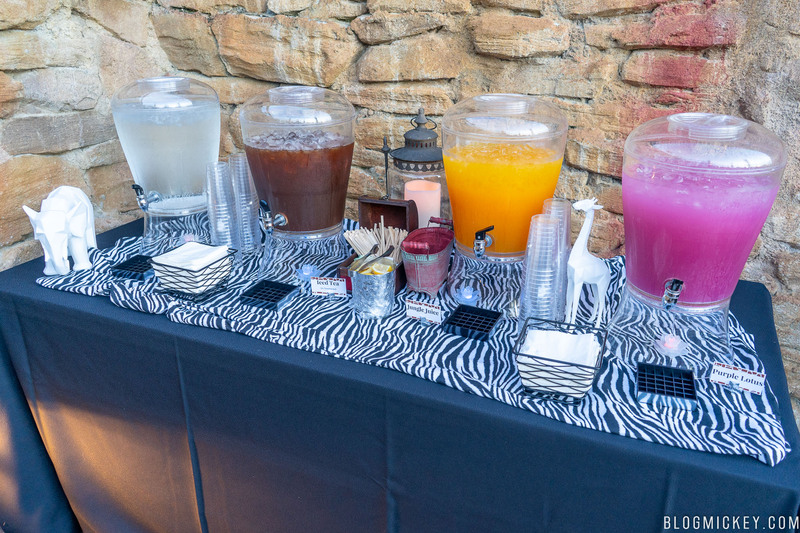 This drink didn’t contain the citrus flavors of the Tiger Lily, despite the presence of Absolut Citron. This drink ended up more on the Chai Tea side of things than the Absolut Citron + sour mix side of things, but it wasn’t bad. If you’re looking for something refreshing though, stick with the Tiger Lily. We didn’t try the wines, but we did try the Tiger Beer. This is a wonderful beer for the warm summer evenings. It’s light with a good amount of carbonation. It’s billed as a tropical lager that was born out of the hot streets of Singapore and it delivers on the refreshing tones promised. The only other spots you can find Tiger Beer at Walt Disney World is Thirsty River Bar & Trek Snacks and Warung Outpost. Both locations carry it for $10. 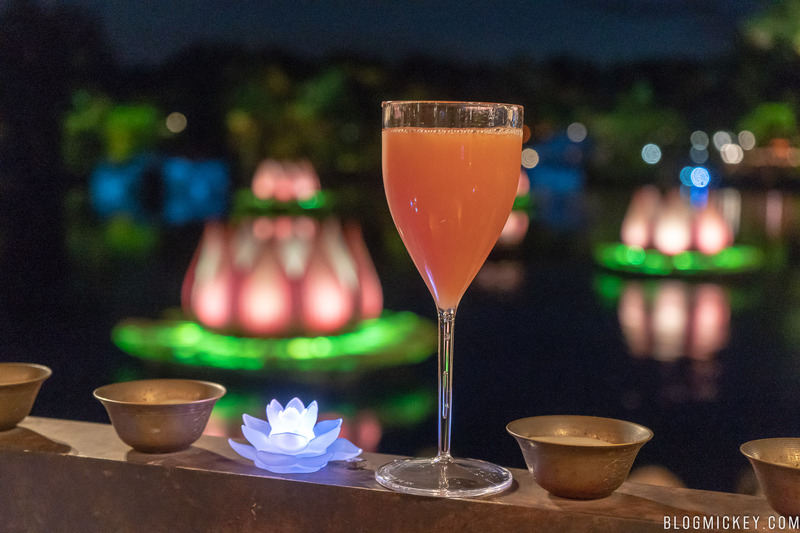 As far as non-alcoholic drinks are concerned, you have the standard water and ice tea offerings as well as two specially made drinks – the Purple Lotus and Jungle Juice. Kids joining in on the fun receive a glowing lantern souvenir cup. 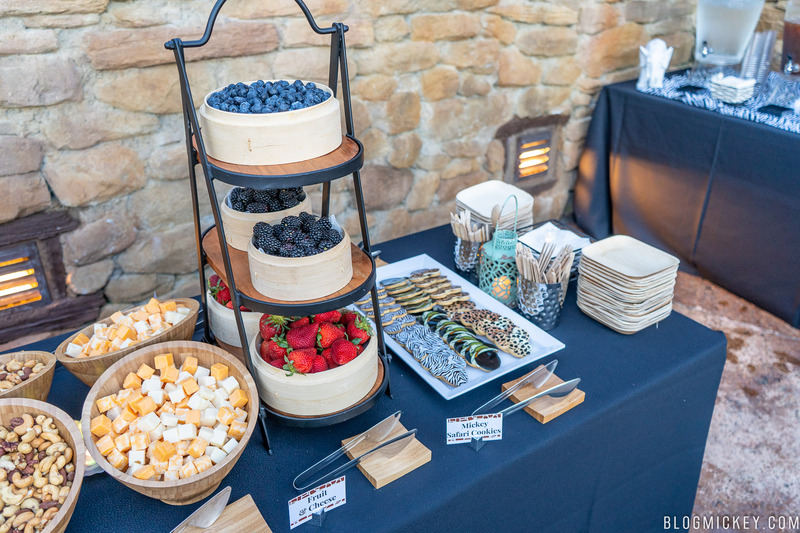 Come showtime, you’ve probably made a few trips to the dessert station and the bar, but you do have one more choice to make – where to watch the show from. 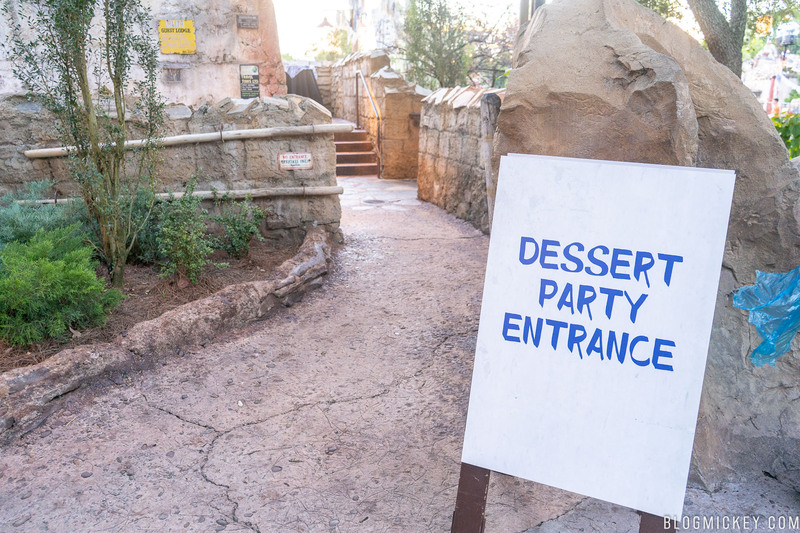 There is a roped off section that is attached to the dessert party just for party guests. That is, until the show starts, but more on that in a bit. 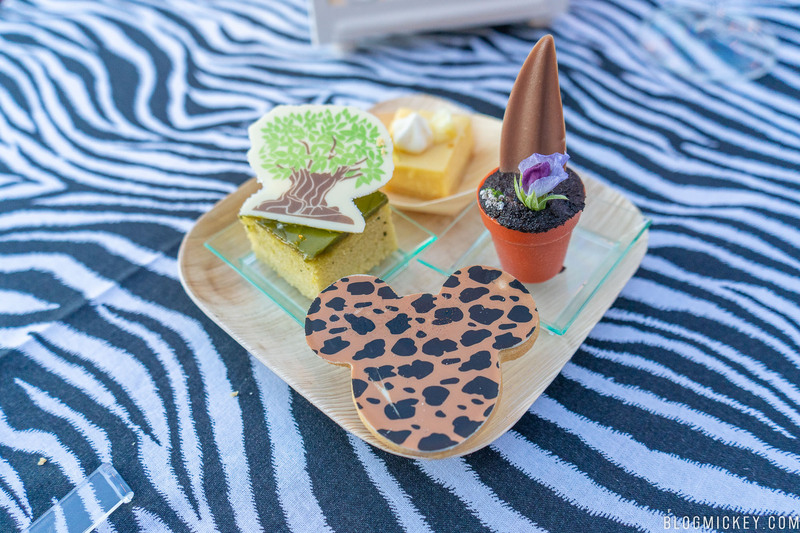 You can see FastPass guests already seated at 8:08pm, or two desserts and Tiger Lily if you’re part of the dessert party. 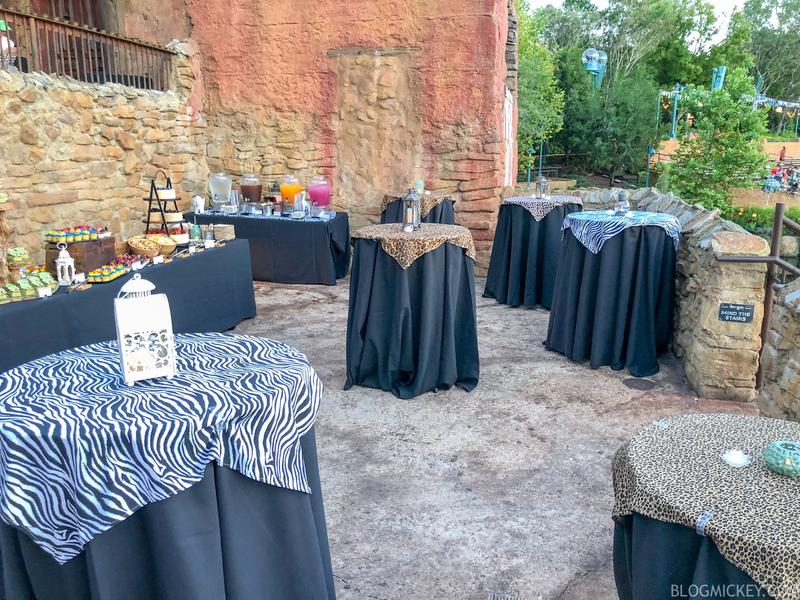 The seating area is open throughout the dessert party, so if you feel like sitting in the front row just make your way down a bit earlier than the rest of the guests and enjoy! If you don’t care where you sit as much, then you’re able to to secure a seat right up to the beginning of the show. 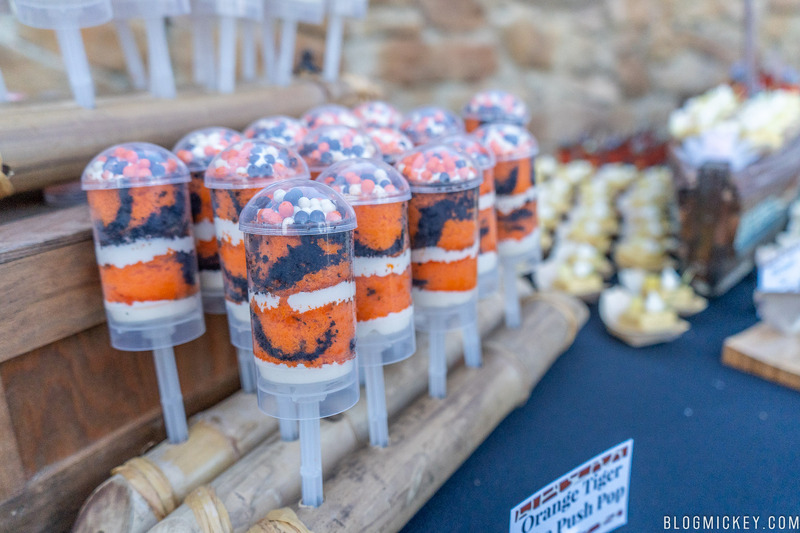 If, like us, you don’t mind standing and enjoying the dessert party some more, all dessert stations and bars remain open throughout the entire Rivers of Light show and even a few minutes after if you’d like to grab a few things for the walk back to the car. 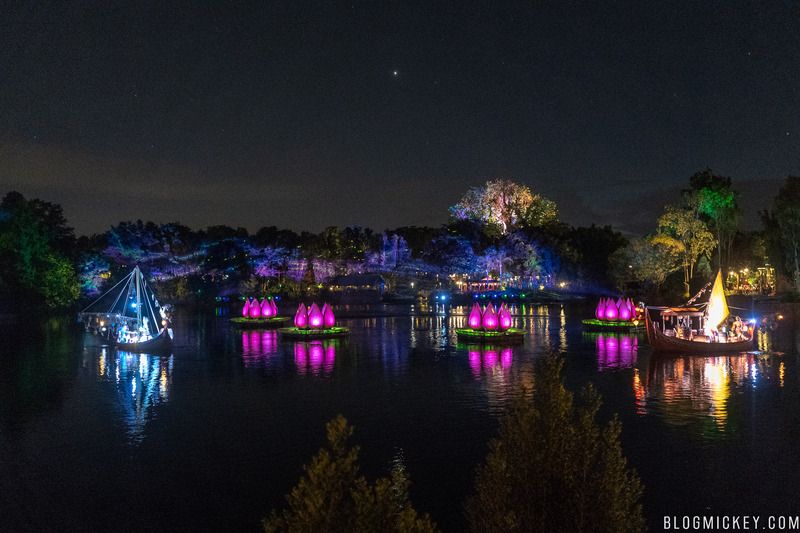 Now, once the show starts, Cast do ask that you stay in the location that you choose to watch the show from due to greatly reduced lighting and the experience of others. We did notice that just a few minutes prior to showtime Cast started to backfill the roped off section with FastPass guests. 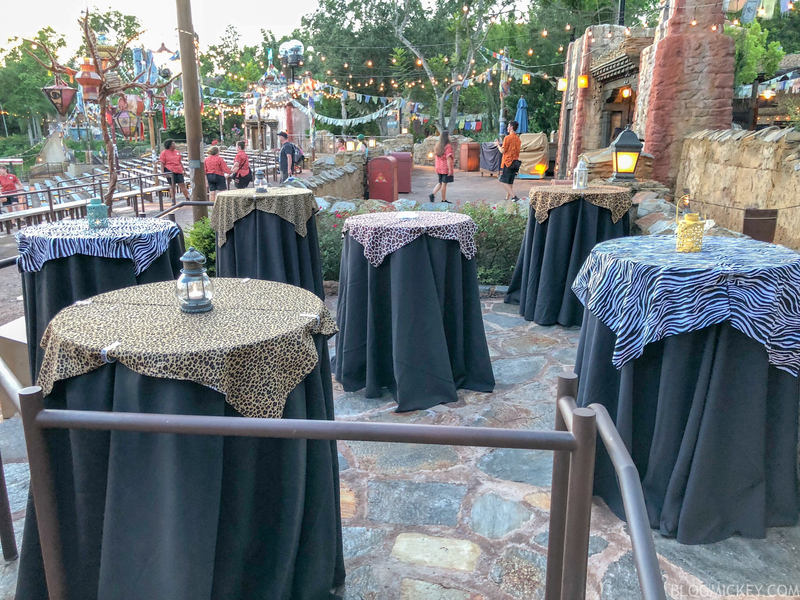 While it made the section feel a little less exclusive, everyone from the dessert party had already secured the seating that they wanted. 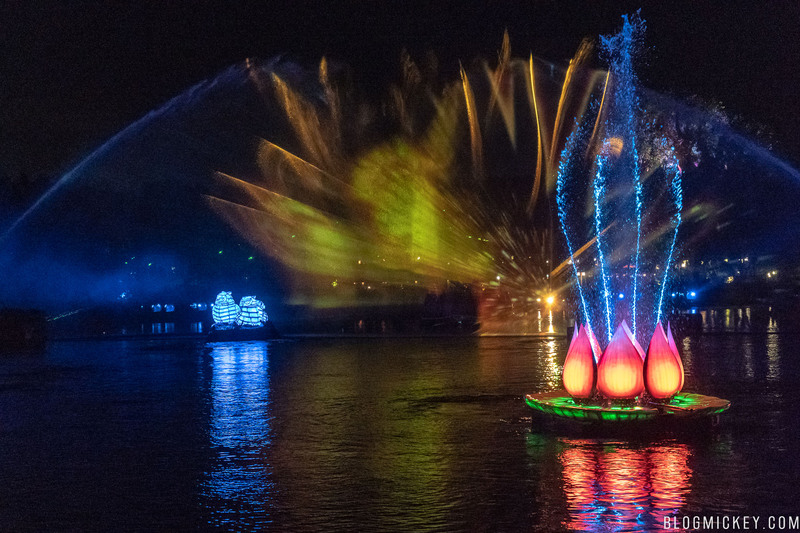 If you’ve never seen Rivers of Light, here’s our full multi-angle view of Animal Kingdom’s Nighttime Spectacular. 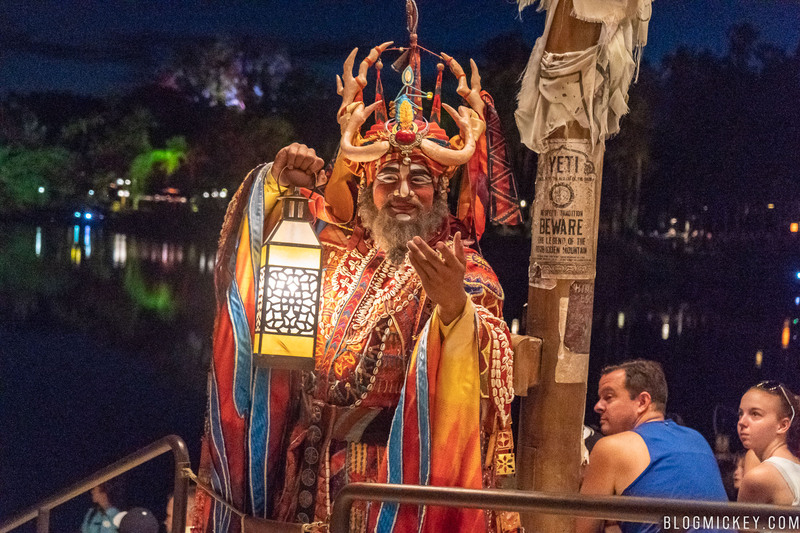 A nice thing about the dessert party seating area is that it’s right in the middle of the shamans and their acolyte path to their boat, so they interact with the dessert party guests as the show begins. 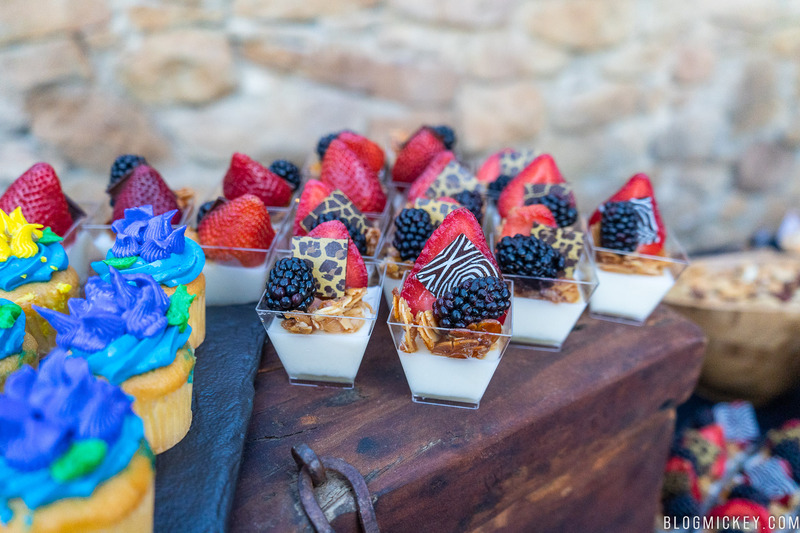 Overall, this dessert party is a winner. 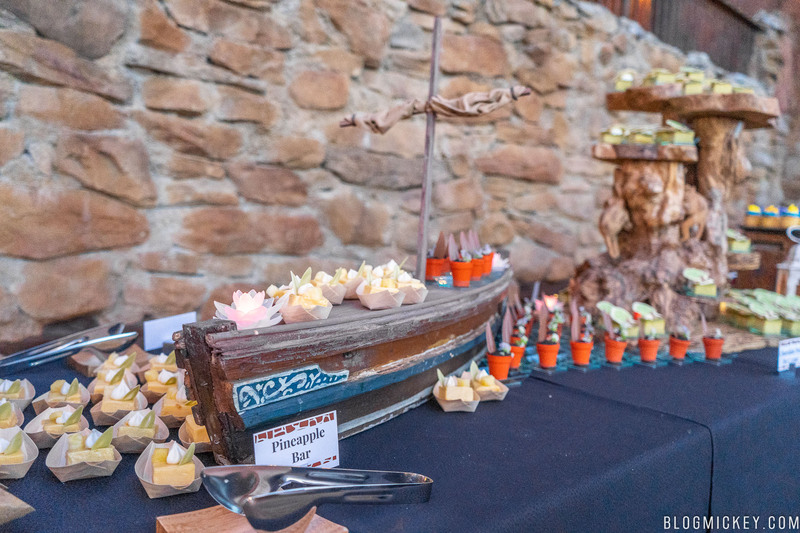 There is certainly value to be found between the 90 minutes of open bar and the ability to grab some desserts and drinks as you leave. 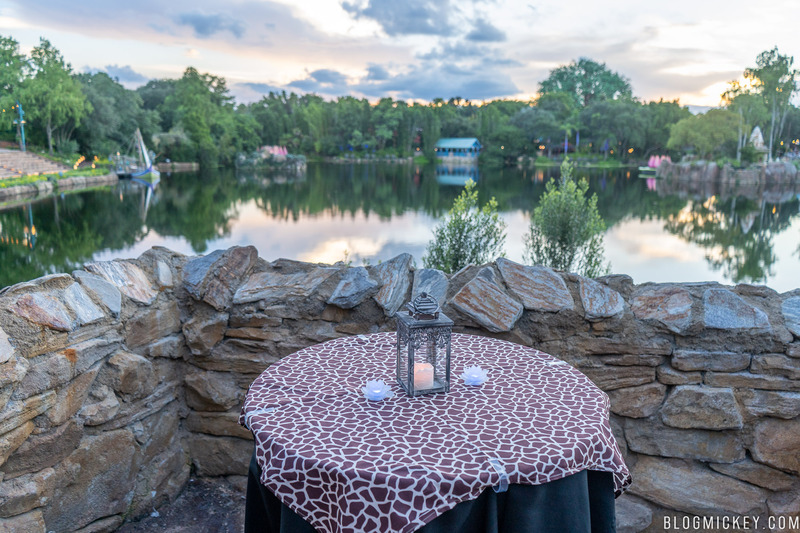 We found it to be a very intimate and exclusive space, which we enjoyed over something like the Wishes (now Happily Ever After) dessert party when we last did it. 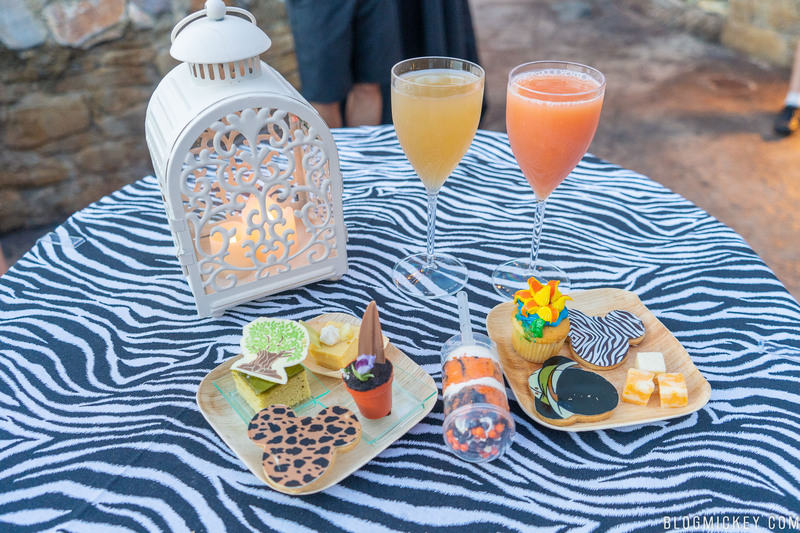 The desserts were all thoughtfully made and enjoyable, and the drinks were refreshing. 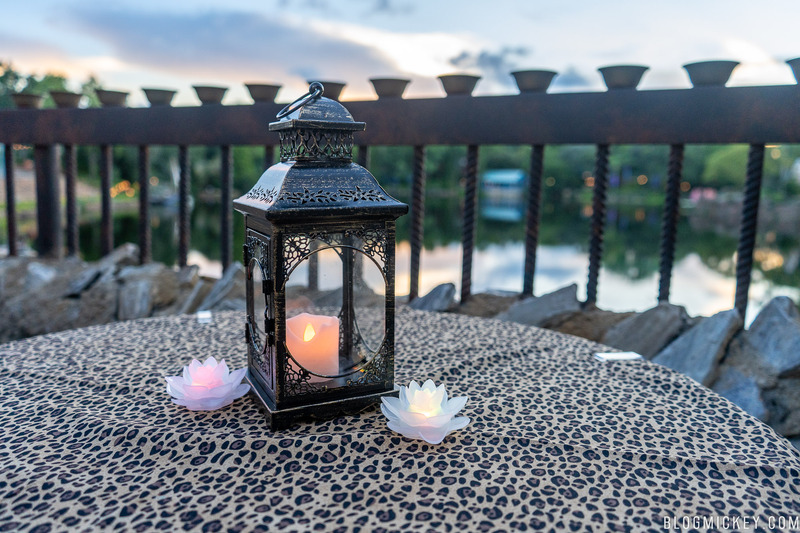 If you’re looking for a more intimate dessert party and want to fit Rivers of Light into your next vacation, we can definitely recommend the Rivers of Light Dessert Party.